Iain Norris of JN Hire The Harbour Kilkeel presents a cheque for £406.00 to Eamon Murphy PIPS Newry and Mourne. 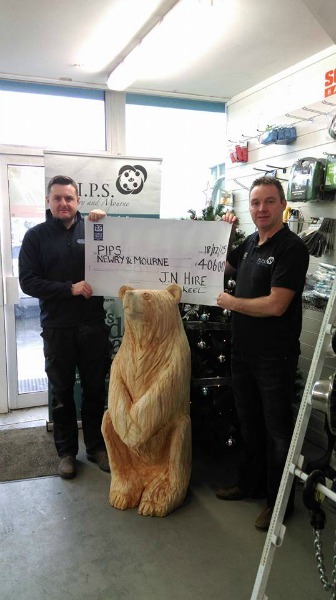 Staff in the Kilkeel store raised the fantastic total through the raffle of a unique carving, created using various chainsaws in store. The carving was completed by artist James P Stewart, carving from a solid piece from a tree. PIPS Newry and Mourne extend their sincerest gratitude to the staff and customers of JN Hire for their kind donations and support.